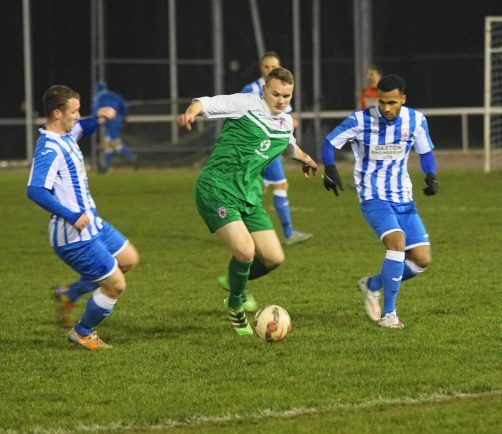 BROMSGROVE SPORTING’S title aspirations hit a huge stumbling block on a calamitous night against a well organised Nuneaton Griff side, report by Adam Warner. Sporting matched their hosts in the first half and were unlucky to go in with a deficit but the second half was a different story with two early goals for Griff and a second yellow card for Sporting left-back Jake Willcox putting the game out of reach. The result sees Griff close the gap on league leaders Sporting to two points whilst Coventry United lie in third, a further two points behind, but crucially with three games in hand on both of the sides above them. Griff started the game stronger with winger Josh Ruff causing problems down the left wing and Kyle Baxter whipping in some dangerous set pieces. However, it was Sporting who had the game’s first clear cut chance on 12 minutes when a Sam Wills corner found Sean Brain unmarked at the near post who headed just wide. On the half hour mark, Wills cut in from the left wing and fired into the side netting; a shot which many of the large traveling contingent of Sporting fans momentarily thought had gone in. Griff broke the deadlock when a Baxter corner was met by Luke Shorthouse. Although Sporting ‘keeper Chris Jay managed to save his headed effort he couldn’t push the ball far enough away and the ball was fired home by Dave Barnett giving the home team a 1-0 lead at the break. The second half started in similar fashion and it wasn’t long before Alex Naughton found himself through on goal. He steered clear of Sporting defender Craig Jones and gave Jay no chance with a perfectly placed shot into the top right corner. Soon after Sporting managed to bundle the ball into the net but it was disallowed for a foul on Griff ‘keeper George Woodward. After this Griff went up the other end and the ball found Baxter in the penalty area. Jones looked to have the situation under control but Baxter somehow managed to squeeze the ball past both Jones and Jay to give his side a 3-0 lead before the hour mark. On 70 minutes the game was put beyond the reach of Sporting when Willcox, who was already on a yellow card, foolishly pulled back Ruff and was promptly sent for an early shower by referee Ryan Haynes. Sporting seemed to play better after this with substitute Josh Westwood, a new signing from Cadbury Athletic, looking particularly dangerous. However, it was Griff who rounded off the scoring in the 89th minute when substitute Danny Edmond expertly chipped the on-rushing Jay to make it 4-0. Sporting have the opportunity to bounce back with two games over the Easter weekend. They take on Studley at the Beehive tomorrow (Saturday) before heading to Pershore Town on Easter Monday (28th March).